Thursday Night Football games are some of the most exciting match-ups during the regular NFL season. With over a dozen regular season games scheduled on Thursday nights each year, you’ll want to make sure you have your streaming source secured in time to catch as many games as possible. Although traditional cable has been a mainstay for NFL fans, you can watch Thursday Night Football without cable from a large number of low-cost services. Read on to find out more. What Channels Are Thursday Night Football Games On? Amazon Prime is its own, standalone streaming service. You can easily sign from Amazon.com and get Thursday Night Football games as another perk to using the service. A sports-centric streaming service that’s completely unique on the market, fuboTV offers exactly what you need to get Thursday Night Football games each year, including for the remainder of 2018. The service carries NFL Network, and may also carry a local FOX broadcast in your area. fuboTV carries anywhere between 50 to 100+ channels, depending on which streaming package you choose, and where you live. 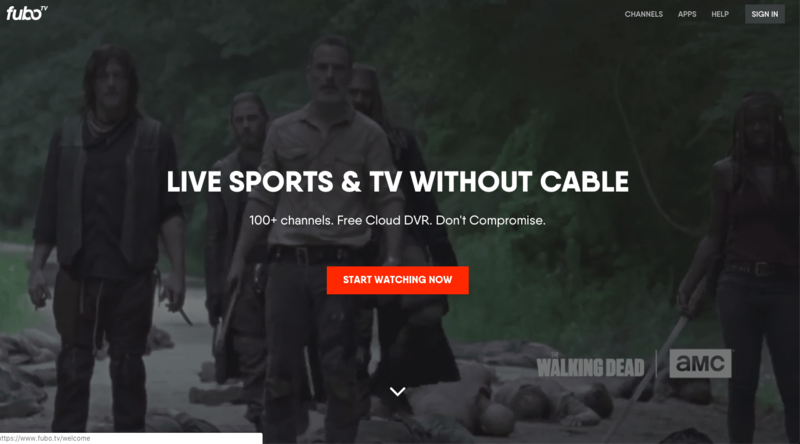 If you log onto fuboTV’s website from your computer, you’ll be shown exactly how many channels are offered to you, and whether or not the service offers a local FOX broadcast for you through its service. If you do find that FOX is available through fuboTV for you, you’ll only need to use their lower-cost “fubo” package. For $44.99 per month, you’ll get FOX as well as a large number of must-have entertainment channels, such as AMC, SYFY, TNT, TBS, HGTV and more. Can’t find FOX broadcasts in your area through fuboTV? No problem! NFL Network is also available through the service, and also in the “fubo” package. As a result, fuboTV is an excellent option for pretty much anyone looking to get Thursday Night Football matches as well as a large number of other NFL games throughout the year. You might be a bit wary of fuboTV’s price, but for this service, the value is all in the features. For the price of your subscription, fuboTV throws in two device streams per account. That’s great if you want to watch Thursday Night Football while a family member or friend watches something on HGTV. If two streams aren’t enough, you can add a third stream using fuboTV’s Family Share add-on, which costs $6/month. The service also comes with a rather healthy 30-hour cloud DVR. If that seems small to you, you can up that to a rather impressive 500-hour storage limit using fuboTV’s Cloud DVR Plus add-on, which costs $10/month. Both options allow you to keep your videos indefinitely, so you can record and come back to whenever you want. Should you opt to go with fuboTV, not only will you get a 7-day free trial, but you’ll also be able to download the service on a large number of devices. iOS and Android devices are supported, as are popular streaming devices like the Roku, Amazon Fire TV, Apple TV, Android TV, and Chromecast. You can also stream directly over the web through your browser. One of the oldest OTT internet TV streaming services on the market, Sling TV offers everything you need to get Thursday Night Football games. Both FOX and NFL Network are available and at a low price. 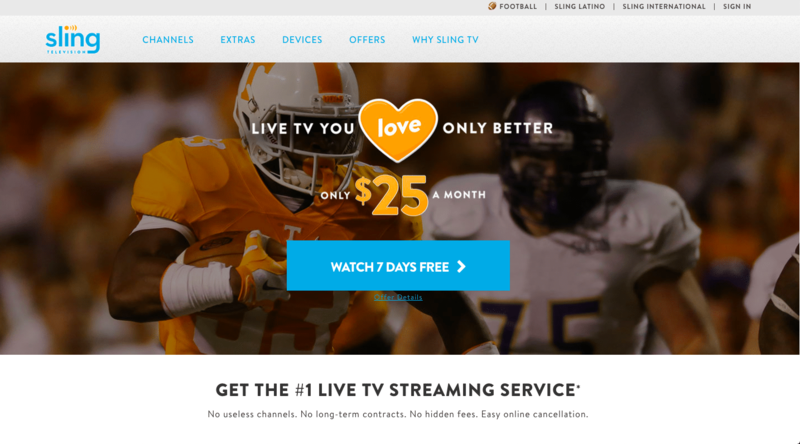 Sling TV has 3 subscription packages to offer up. The two lowest-cost ones, Sling Orange and Sling Blue, are both $25 per month. The third option is to combine both Sling Orange + Blue and receive all of the channels offered in both packages. For Thursday Night Football fans, your best option is Sling Blue. Sling Blue offers around 45 channels, depending on where you live, and is the option to use if you want FOX and NFL Network. You can use Sling TV’s local channel lookup tool to see if a FOX broadcaster is available to you through their service. Even if it’s not available, however, you can still use Sling TV to get access to NFL Network at a low cost and watch Thursday Night Football without cable. Sling TV’s features change, depending on if you choose Sling Blue or Sling Orange. Since you’ll be opting for Sling Blue to watch the NFL, you’ll get 3 simultaneous streams per account. That’s a better deal than the single stream that comes with Sling Orange. And while you don’t get a DVR as part of your subscription with Sling TV’s packages, you can add a 50-hour cloud DVR for just $5 per month. Even with that addon, you’ll still be paying less than you would with fuboTV, although you will have far fewer channels. Regardless of which channel package you take with Sling TV, you’ll get a 7-day free trial and wide device coverage. Sling TV has apps available for iOS and Android, Roku, Chromecast, Apple TV, Amazon Fire TV, select LG and Samsung Smart TVs, and even a few game consoles. As long as you can get a local FOX broadcaster through Hulu with Live TV, this service is going to be a good option, especially due to its features, great channel selection and simplified user experience. Hulu has one core package available to new subscribers. You can get Hulu with Live TV for just $39.99 per month. For that price, you’ll get between 50-70 channels, including FOX. However, as with every other streaming service on your list, you’ll need to double check to ensure you can actually get FOX from Hulu with Live TV. To do so, you can go to the main page for the service, and then click on “View Channels In Your Area”. From there, enter your ZIP code. If you find that Hulu doesn’t offer FOX in your area, we suggest you look elsewhere on our list. Unfortunately, Hulu with Live TV does not provide NFL Network, so you won’t have a backup option to get Thursday Night Football through this service. Did you luck out and find that Hulu offers FOX in your area? Then you’re in for a treat, as this service has great features which make it great for watching Thursday Night Football without cable. Hulu with Live TV offers 2 simultaneous streams per account, which is on the lower end. However, you can upgrade that to an unlimited number of streams on the same account while using the same WiFi network, and also stream on up to 3 devices outside of your home network with the Unlimited Screens add-on. That will set you back $14.99 per month, however. This service comes with a fairly generous 50-hour cloud DVR. If that’s not enough, however, you can up that to 200 hours with Enhanced Cloud DVR, which also costs $14.99 per month. You can combine Unlimited Screens and Enhanced Cloud DVR for $19.99 per month. Additionally, Hulu with Live TV also rolls the entire Hulu on-demand catalog into your account. That’s an $8/month value. You can try Hulu with Live TV for free for 7 days, and stream the service on iOS, Android, Chromecast, Amazon Fire TV, Apple TV, Roku, Xbox (One and 360), Nintendo Switch, select LG and Samsung smart TVs, and your web browser. YouTube TV is one of the best services on the market, and it has improved by leaps and bounds since it first was offered in early 2017. It offers FOX in some areas, but it’s also not available everywhere the US quite yet, so you may (or may not) find it to be a good option for watching Thursday Night Football without cable. YouTube TV offers one of the simplest package options on the market for anyone looking to watch Thursday Night Football without cable. You can subscribe to the service for just $40 per month, and get 60-70+ channels, depending on where you live. Also depending on your location, you’ll get access to a local FOX broadcast affiliate. YouTube TV has a channel lookup tool on its main website that you can use to determine two things: whether or not YouTube TV carries FOX in your area, and whether or not the service is even available to you. At present, YouTube TV is available in most large cities across the US, but if you’re in smaller towns or cities and in most rural areas, you probably won’t be able to use the service at all. As with Hulu, if there’s no FOX, you won’t be able to use this service for Thursday Night Football, as it does not carry NFL Network. Should the stars align and you can get FOX through YouTube TV, you’ll be able to access one of the most extensive feature packages on the market. YouTube TV offers users 3 device streams per account and lets you create 6 user profiles per account as well. Additionally, you’ll get an unlimited cloud DVR with videos that don’t expire for 9 months. Even better, each individual user profile gets their own cloud DVR. YouTube TV has recently improved its device coverage, though it still lags behind some competitors like Hulu With Live TV. You can use the service on most web browsers, iOS, Android, Chromecast, Roku, Apple TV, Android TV, Xbox One, and a handful of smart TVs. But if you’re using Amazon Fire TV or Fire TV Stick (one of the most popular streaming devices on the market), you won’t have an app available. Google (which owns YouTube) and Amazon have been involved in a silly feud for over a year now –so YouTube TV still doesn’t support the Fire TV, and we have no idea if this will change in the future. Still, it’s a good option, and you can get YouTube TV with a 7-day free trial. 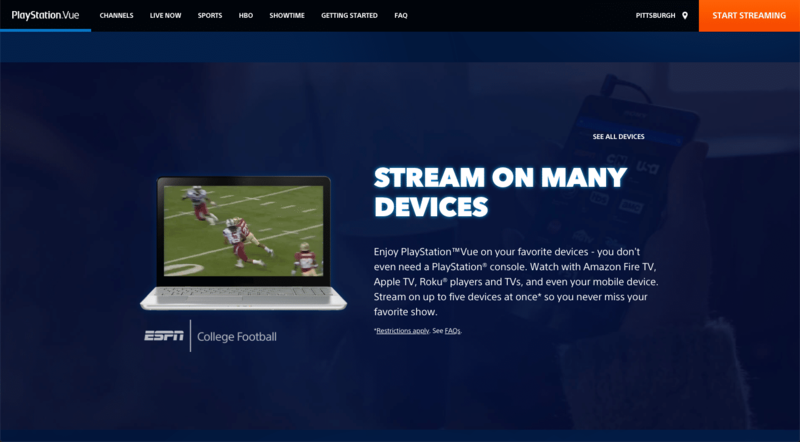 PlayStation Vue is one of the most loved cord-cutting options on the market. It’s on the pricey side for anyone who wants Thursday Night Football without cable, but it’s also feature-rich and packed with channels. If all you want is FOX, and PlayStation Vue carries FOX in your area, you’ll find the Access package serves you well. However, if you want NFL Network as a backup option, you’ll need to use the Core package, which throws in NFL Network as well as a few other sports and entertainment channels. PlayStation Vue is expensive compared to the other options. But it also has a very nice set of features. First, you can stream on up to 5 different devices on one account. That’s far more than any other service on our list without having to pay any extra fees. And while the service has a somewhat limited 28-day DVR, it also allows you to record an unlimited amount of shows during that time, and you’ll usually be able to catch up on all of your shows before your DVR recordings expire. Device coverage for PS Vue is extensive. Despite the name, you don’t need a PlayStation console to use the service, although it does certainly work natively with PlayStation 3 and PlayStation 4 consoles. However, you can also use the service straight from a web browser, or through dedicated apps for Amazon Fire TV, Apple TV, Android TV, Roku, Chromecast, and even Amazon Fire tablets. PlayStation Vue offers a 5-day free trial with any subscription package. Similarly to PlayStation Vue, DirecTV Now is a variable option, but its features leave a lot to desire. You’ll need to use DirecTV Now’s local channel lookup tool to determine if FOX is available in your area through the service. If you can get FOX in your area through DTV Now, the lower-cost Live A Little package will work well for you. However, if FOX is unavailable, or you want a backup option for Thursday Night Football, opt for the Just Right package, which carries NFL Network as well as FOX and other channels. DirecTV Now’s features are woefully underwhelming. Through this service, you’ll get a 20-hour cloud DVR, which is the absolute rock bottom among all of the services. And unlike some of the other services, you can’t even pay to increase that limit. Additionally, that’s the limit regardless of which package you choose. You will also only get two device stream per account with DirecTV Now. That’s about even with most of the other services, and you can add a third stream for an extra $5 per month, which is a nice option to have. On the bright side, this service has a 7-day free trial and wide device coverage. You can use DirecTV Now on almost any device on every major TV streaming device, select Samsung TVs, and on Chrome and Safari web browsers. Not convinced a streaming service is what you want? You can stream directly from your TV with an over-the-air (OTA) antenna. Major broadcasters such as FOX, NBC, ABC, and CBS are required to broadcast their channels using digital signals that can be picked up for free by digital antennas. Not interested in trying to set up an antenna? You can stream local broadcast live online using the Locast website or app. This new and free service is only available in a handful of major cities, including New York and Chicago, but it’s a great option for those who want a no-hassle streaming option for local broadcasts.